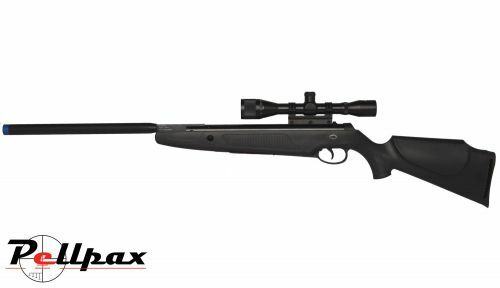 A powerful, reliable air rifle the Dragon GRS Evolution MAX has all the features needed for pest control or target shooting. The full length rifle helps give this gun a good weight as well as look. The Barrel has been fully anodised which prevents it from damage and rust whilst also giving it a high quality finish. The body of the gun is made from a high grade synthetic which makes it aesthetically pleasing as well as durable. The barrel also has a suppressor allowing for silent, effective shots whether it's for hunting or target practice. The Dragon uses a Gas ram internal system. These have benefits over a spring air rifle such as a greater accuracy, longer life and less recoil. The stock includes a ventilated rubber pad which makes it comfortable to use and absorbs the recoil of the guns. This air rifle has an automatic safety and a checkering pistol grip. These are good safety features as it ensures a secure grip and means the gun will not fire until the safety is off. Add this item to your basket & spend an extra £368.62 to apply for finance.